The shaking or jerking motion of the earth surface vertically or horizontally is called an earthquake. The Hypocenter is the point inside the earth where the earthquake originates. The Epicenter is the point on the earth surface that is vertically above the hypocenter. The seismic waves are the ways or the vibration traveled in a different direction from the epicenter. A seismograph is an instrument that measures the intensity, origin and speed of the earthquake. The intensity of an earthquake is measured in Richter scale. The adjustment of the continental plates inside the earth by colliding causes tremor at the hypocenter. Large deposition of soil by the rivers causes huge pressure on the earth. Destruction of the building, roads, electricity supply, etc. Affects on human and animal lives. Formation of the lake, small hills etc. A tsunami is a series of water waves caused by the displacement of a large volume of a body of water, usually a sea or ocean. Tsunamis are often barely visible when they are in the deep sea. This makes tsunami detection in the deep sea very difficult. 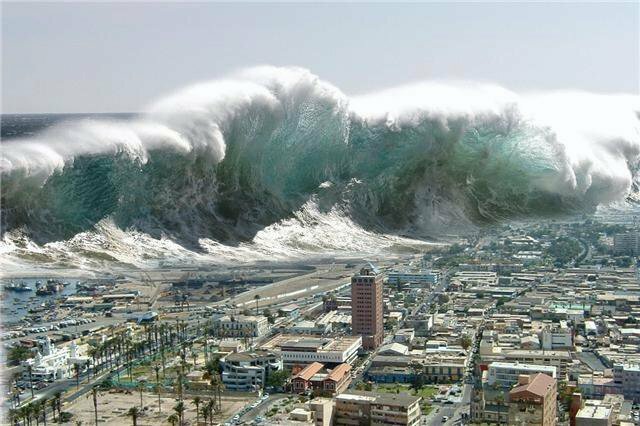 A tsunami can travel at well over 970 kph (600 mph) in the open ocean. A tsunami may be less than a foot (30 centimeters) in height on the surface of the open ocean. But the powerful shockwave of energy travels rapidly through the ocean as fast as a commercial jet. Once a tsunami reaches shallow water near the coast, it is slowed down. The top of the wave moves faster than the bottom, causing the sea to rise dramatically. The shaking or jerking motion of the earth’s surface vertically or horizontally is called an earthquake. The instrument that measures the intensity, origin and speed of the quake is called seismograph. Causes of an earthquake are a volcanic eruption, underground bomb testing, large deposition of soil, etc. The point inside the earth where the earthquake originates is hypocenter. EarthUncutTV's Best Volcano Eruption Footage Shots! "Earthquake cannot be stopped but we can prevent ourselves from the disasters." Clarify in a sentence. Earthquake is mainly caused due to the movement of continental places that are enormous and manually immobile, which does not depend on the tasks carried out by human beings. So, it can't be stopped, rather we can prevent us from the disasters following proper ways for construction. Hypocenter is the inner place of the earth where earthquake originates at first. Epicenter is the place on the surface of the earth where the first vibration of the earthquake arrives from the hypocenter. Earthquake is the shaking movement of the earth surface. It occur at the joining parts of the continental plates when they move floating in the very hot liquid or semi liquid materials. Volcano is the spewing of the earth. It occurs where there is crack on the surface of the earth or the weak place which cannot bear the pressure of hot liquid of the inner part of the earth. Describe in brief about the cause and effects of earthquake? Earthquake is the shaking movement of the earth surface. There are many causes of its occurrence. The tectonic movement is an important cause of it. As we know, the earth's crust is divided into several parts due to deep cracks or faults which are known as continental plates. Some of them keep moving apart and some may move into each other. In this process, a big fault may occur which result in occurrence of earthquake. Eruption of volcano also causes the earthquake. When volcano occurs, lava comes out with great force causing earthquake. It leads to loss of life and property. Infrastructure such as roads, bridges, hospitals etc. get destroyed. It causes landslide, tsunami, etc. which result in further complication. There will be formation of mountains, seas etc. List out of the effects of earthquake. The buildings and houses fall down due to earthquake. Earthquake causes landslide tsunami and storms. They cause a lot of damage. what are the distribution of earthquakes? what are the awareness and safety measures of it? The point on the earth's surface that is vertically above the hypocenter is called? What are the effects of the earthquake? Houses and bridges collapse taking the lives of many people. People die of hunger and starving. What safety measures should be taken to be safe and secure during earthquake? Should run and save our life during the time of earthquake. We should lock the doors and remain inside our house. We shouldnot hide under the table. Give a geographical reason why ktm belongs to the one among earthquake high risk cities in the world ? Any Questions on 'Natural Disasters: Earthquake and Tsunami '?